It’s that time of year, the weather’s getting warmer, the trees are full, the grass is greener, and you know what that means? Mosquitoes! Just kidding; that means, of course, that you and your family will be spending a lot more time outdoors, swimming, grilling, playing ball, et al. Oh, and you’ll be doing that while surrounded by your fence. Sure, fences are functional, but there’s no reason they can’t be aesthetic, too. If you’re going to sell your house, or just plan on enjoying the great outdoors with family and friends, there’s no reason you can’t do it enclosed in something functional AND stunning. 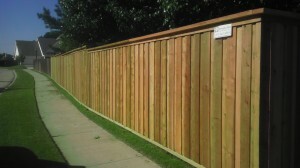 Just remember a few things prior to purchasing a new fence, and doing so will make it last many, many more years. It’s a bit of a “pay me now, or pay me later” situation. Make sure the nails used are galvanized and ring shanked, which won’t work their way out of the wood (think soccer balls, baseballs hitting the fence time and again!). And if you want your fence to last, say, 12 more years than it would normally, make sure it’s stained on a regular basis, preferably every 3 – 5 years. Your fence needs to be stained with a commercial grade product that is designed specifically for our humid conditions; it should be semi-transparent, which penetrates the wood and provides for much better protection. In addition, it needs to be oil-based, which enables the stain to act as a sealer. One more thing regarding staining: don’t utilize pre-stained wood, which oftentimes is stained while the wood is still wet, which prevents the wood from being fully penetrated. Make sure the fence is off the ground to ensure it doesn’t get marred by water damage, and use steel posts, as opposed to wood ones. 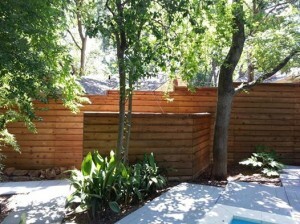 In fact, many cities in the Metroplex don’t approve replacement or new fences with wooden posts. Remembering these tips will save you money down the road, and keep your backyard securely enclosed and looking great!